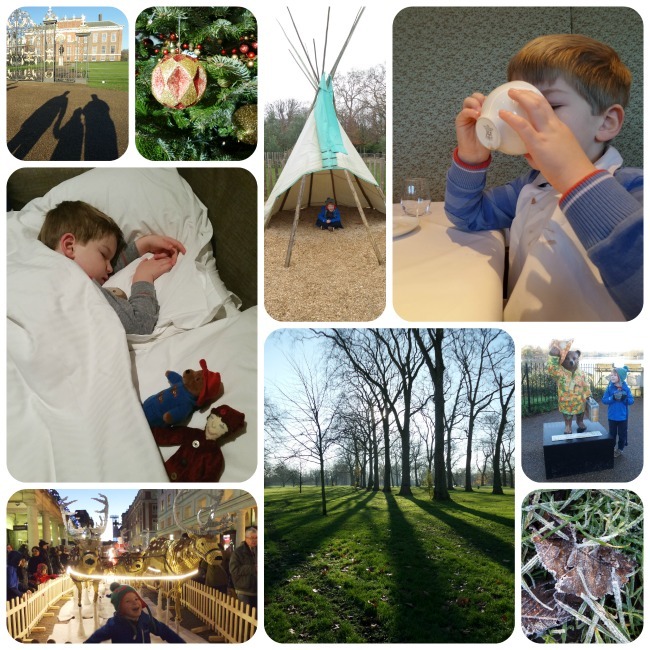 We've stayed in London several times as a family and, after a disasterous stay in a trendy boutique when The Boy was 2.5 years old, we've never stayed anywhere other than Premier Inn; it's child friendly and I don't spend the entire time feeling I need to apologise for him. In all honesty I wouldn't necessarily have considered a luxury hotel, and that's where I've been making a mistake all this time. The Royal Garden Hotel is a five star hotel based in the wonderful Kensington with leafy parks and panoramic views of Kensington Palace and Gardens, Hyde Park and London’s skyline. With 394 rooms (four different styles) and 17 suites, there are a variety of rooms to suit all. We stayed in an executive room which is ideal for two adults and up to two children as it features a superking size bed and a wide sofa bed. I have noticed in the past that often the floor space of a room is compromised when a sofa bed is pulled out, however the room was enormous and there was loads of space for an exuberant five and a half year old! When we arrived the sofa-bed was already made up ready for a very tired little boy (complete with bed-guards on both sides) and our bed was turned down ready for our weary bodies after a 3.5 hour drive from Cardiff. There were two lovely treats set out for us when we piled into the room, a side table of lovely fruit and freshly baked mince pies, and a bag of goodies to keep The Boy entertained. I was highly impressed with the thought that had gone into the children's bag; activity booklet, colouring pencils, jelly sweets, water bottle, cuddly toy and a healthy snack bar. The Boy was over the moon with his special back pack. I checked on reception the next day and the gift bag is standard for all children staying in the hotel, as are the welcome snacks. 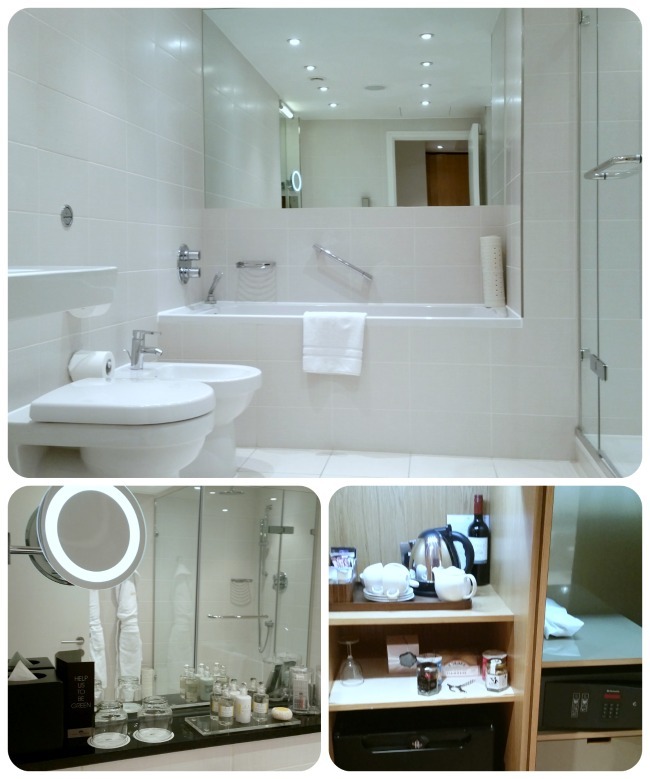 I joked with the porter who showed us to our room that the bathroom was bigger than some of the hotel rooms we've stayed in in London, and it's true! A large shower cubicle separate to a sumptuous bath, toilet, bidet and a large basin with complimentary toiletries. I was thoroughly impressed that non-slip mats were provided for both the shower and the bath, and that the bath had a removable showerhead which makes it much easier when bathing a young child. It's also worth noting that there are two wardrobes in the room, one of which also contains a mini-bar, kettle and hot drinks facilities, and a safe which was of course big enough for my laptop and camera! We slept amazingly well, the thick curtains acted as a wonderful black-out, the heating/aircon system was perfect and for once we weren't all snuffly in the morning. Then to breakfast the next morning. And what a breakfast! 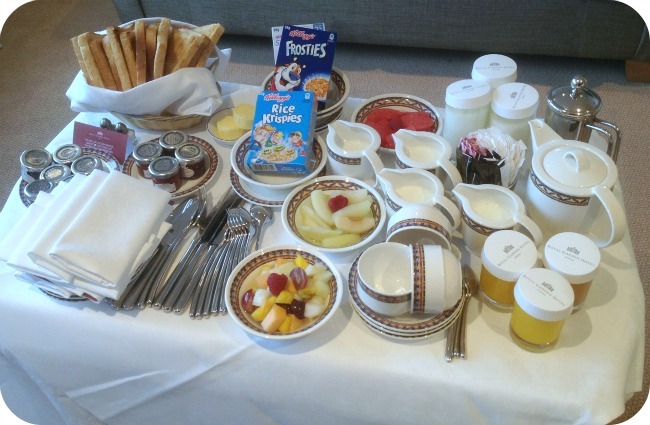 There are three different breakfasts available; a light one consisting of pastries and coffee, a continental breakfast, and a full breakfast which consists of a full cooked meal and the continental selection. 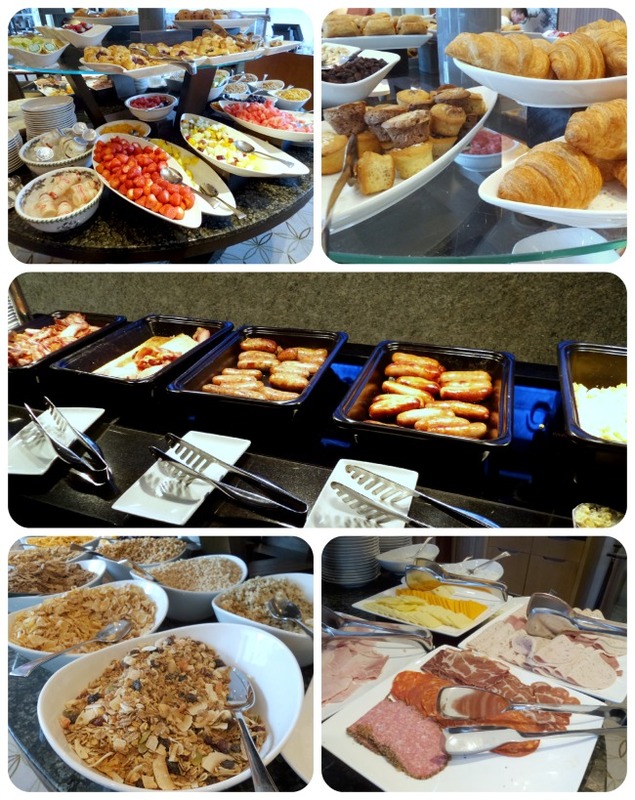 We all had a full breakfast and thoroughly enjoyed the range available; the pastries were delicious, the fruit available was a refreshing change and my husband was overjoyed with the three different sausages and two different bacons available in the hot buffet. The only criticism I have is that there isn't a vegetarian sausage available, which I found surprising. Breakfast is available via room service and so of course on the Saturday night we decided it was necessary to fully test the facilities offered by the hotel and therefore had to order breakfast in bed. We filled in the form and hung it on our door handle by 2am the night before, and our trolley arrived promptly at the specified time ladened with food; filled to the edges! And even more food was in the hot storage underneath the trolley top which folded up into a table. It was wonderful to sit in our room in our pyjamas, with a decadent breakfast laid out in front of us, overlooking the chimneys of Kensington Palace billowing smoke from the fires, wondering if Prince George was eating his cereal as tidily as The Boy. 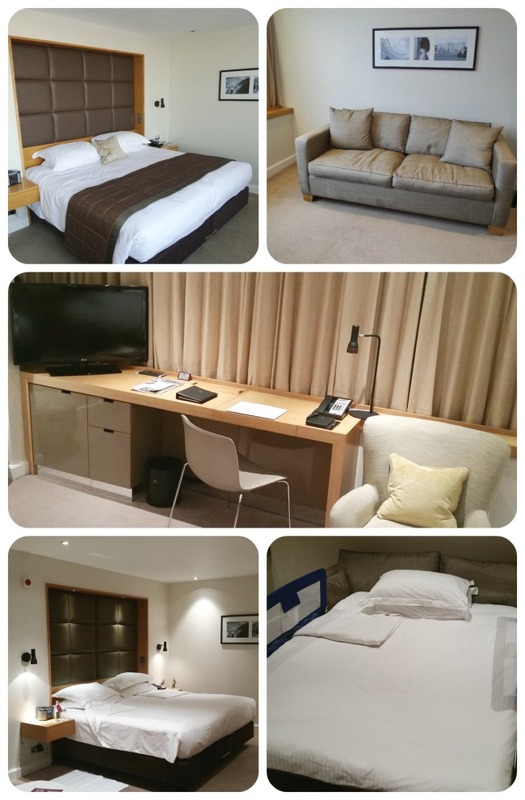 Royal Garden Hotel is situated in a wonderful location, just on the outskirts of all the hustle and bustle of London, but still close enough that it's easy to walk into the very heart of London. On the Saturday we had a wonderful walk through Kensington Palace and Hyde Park, enjoying the frosty leaves and crisp Winter's air, exploring the talking statue of Queen Victoria, before scouting out the Paddingtons scattered around the capital and admiring the 700,000 LEGO bricks which made up Father Christmas on his sleigh pulled by the reindeers in Covent Garden. Yes, the Royal Garden Hotel is a five star luxury hotel in Kensington and therefore prices reflect that, however it is not that much more than some standard chain hotels, and the quality is incomparable. We all enjoyed it all so much and haven't stopped talking about it ever since, we're already trying to work out when we can revisit. It is also worth noting how child friendly the hotel was; bedguards, bathmats, shower head in the bath, children's activity rucksack, the perfect temperature hot chocolate in the restaurant at breakfast, and even down to the convenience of an underground car park, meaning we didn't have to struggle on the train with all of our belongings. Rooms booked more than 21 days in advance receive 15% off. For stays during February half term (13 – 22 Feb) and the Easter holidays (3 – 19 April), families who book 1 room get 1 connecting room half price with full English breakfast and Wi-Fi. I received a complimentary stay at this hotel in order to give my honest opinion about the family friendly aspect to the hotel. We won a competition during the MADs to win an overnight stay here – think we are going to take our daughter for her 6th birthday in April. Absolutely can't wait after reading this review. Very excited they do breakfast in bed! Great photos! It must have been a very memorable time for your family.